​​Making your home and office the ultimate location for exercise. offering High quality personal training and fitness classes in Guelph, Cambridge, Kitchener and Waterloo. In home personal training is the best option for busy people who want to get themselves started on an effective workout routine. No equipment? We are fully equipped with suspension trainers, adjustable kettlebells/dumbbells, resistance bands, foam rollers, and more. Book your weekly workout times and we’ll take care of the rest. Looking for an advanced workout using barbells, sleds, plyoboxes, and battle ropes? Check out personal training at our private studio located at 'The Zone Training' 225 Hanlon Creek Blvd, Guelph. The facility is covered in astro-turf and is an excellent environment for cross-training. If you find yourself skipping workouts because of travel commitments, or you want to train with us but live outside of the Guelph and Waterloo region, try training online through Skype. We will create a program that accomodates with your travel schedule and we will personally visit you to check in on your progress. 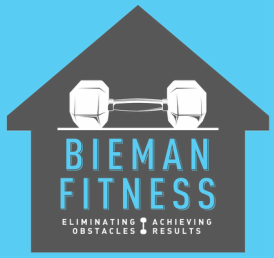 Bieman Fitness also offers semi-private training for those who like working with a partner or friend. Semi private training is normally 2-4 people with one trainer and can be done in home or at our studio. Semi private groups commonly include husband-wife teams, brides and bridesmaids, siblings, and mother-daughter duos.